WHAT A VIEW, 8 wins, 3 to 7, 2018, $903,706, Frank E. Kilroe Mile S (G1T), Thunder Road S (G3T), American S. (G3), California Cup Turf Classic S, Crystal Water S, 2nd Frank E. Kilroe Mile S (G1T), Arcadia S (G2T), California Cup Turf Classic S presented by City National Bank. NORVSKY, 06, g (Flying Paster, Crystal Water): $616,444, San Gabriel S (G2T), California Cup Classic S, California Dreamin’ H twice, 2nd Ralph M. Hinds H, Harry F. Brubaker S, Golden State Cup S, 3rd San Marcos S (G2T), Santana Mile H.
POSHSKY, 10, g (Bold Badgett, Ruhlmann): 13 wins, 3 to 8, placed at 9, 2019, $737,959, Berkeley H (G3A), Crystal Water S, 3rd California Dreamin’ S.
ROVENNA, 11, f (Northern Afleet, Pleasant Colony): $419,030, Melair S, Evening Jewel S, 2nd Soviet Problem S, 3rd California Cup Oaks, Golden State Juvenile Fillies S.
ACCEPTANCE, 12, c (Perfect Mandate, Something Lucky): $406,258, King Glorious S, Golden State Juvenile S, California Flag H, 2nd Let It Ride S, 3rd Donald Valpredo California Cup Sprint S, Cary Grant S.
Fitzsimmons Mile H, 2nd California Flag H, 3rd Albany S, California Flag H.
LINDZ WINZ, 08, f (A++, Smokester, Incinderator, 3X4 Northern Dancer): $351,670, Irish O’Brien S.
ROO’S VALENTINE, 13, f (A++, Cindago, Giant’s Causeway): $302,193, Soviet Problem S, 2nd Fran’s Valentine S, Dream of Summer S, 3rd Evening Jewel S.
EXCESSIVE PASSION, 07, c (A++, In Excess, Lydian): $166,943, Harry Henson S, Sam J. Whiting Memorial H, Everett Nevin Alameda County S, 2nd Morvich S (G3T), sire. at 5, two wins, once 3rd in 3 starts. CIGA Prix de l'Abbaye de Longchamp [G1], etc.). Emirates, $920,800 (USA$), Suburban H. [G2] (BEL, $300,000), Dwyer S.
[G2], 2nd Travers S. [G1], Super Derby [G1], Peter Pan S. [G2]. Sire. Skybet.com Sweet Solera S. [G3], etc. (USA$)(USA), Arlington H. [G3] (AP, $111,600), 2nd Arlington Million S.
(USA$)(USA), Longines Dixie S. [G2] (PIM, $240,000), 3rd King Edward S.
at Laurel Park, 1 1/16 miles in 1:39.74. $25,000), Claire Marine S. (AP, $10,780). Producer. Stunning View (f. by Dynaformer). Winner at 3 in England, $6,340 (USA$). Paul de Moussac Longines [G3], 3rd Prix de Guiche [G3], etc. Leipzig (g. by A.P. Indy). 4 wins, 4 to 7, $120,687. 4 in United Arab Emirates, $29,169 (USA$). Classic S. [G3] (CD, $39,200), 3rd Maxxam Gold Cup S. [L] (HOU, $11,000). Cassiopeia S., 3rd Andromeda S.
Japan, $340,822 (USA$), 2nd Kanto Oaks. Paint the Corners (f. by Tizway). 5 wins, 3 to 5, 2018, $145,076. Metz (g. by Malibu Moon). 4 wins at 3 and 4, $84,884. Scheme (f. by Tizway). Winner at 2, $33,685. Vronsky (c. by Danzig). See below. The Man Himself (c. by Distorted Humor). Winner at 3, $30,280. (USA$), 2nd Justakiss S. (DEL, $10,000). Vocab (g. by Arch). 3 wins at 3 and 4, 2018, $37,065. Providencia S.-L, etc. ), half-sister to VISTO ($61,375, Bay Meadows Oaks). WORDS OF WAR (f. by Lord At War (ARG)). Black type winner, see above. Solario S. [G3], Kleenex Winkfield S., etc. Sire. $81,375(CAN)), Louisiana H. (FG, $36,000), 2nd Grey Breeders' Cup S.
[G2] (WO, $54,700(CAN)), Independence H. (LAD, $10,000), etc. Sire. Weatherbys Bloodstock Insurance Stonehenge S.
New Age (g. by Touch Gold). Winner at 4, $56,368. Snow Rose (f. by Elusive Quality). Winner at 2 in England, $5,139 (USA$). 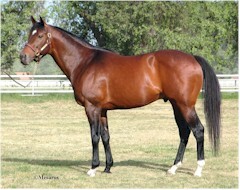 Trakya Trophy, Price Bailey Chartered Accountants Hopeful S.
(HOL, $64,080), Pasadena S. [L] (SA, $48,300). $39,716 (USA$), Grand Criterium de Bordeaux. Producer. Continental Mile S. (MTH, $9,000). Captive Melody (f. by Unbridled's Song). 3 wins at 3 and 4, $117,117. Divine Providence (c. by Lord At War (ARG)). 4 wins at 2 and 3, $104,000. Answer the Call (g. by A. P. Warrior). 4 wins at 3 and 4, $45,310. Zahrah (f. by Kitten's Joy). Winner at 3, $15,814. Racing Hall of Fame S.-R (RET, $5,500). $243,154, 2nd Pasadena S. (SA, $15,900). (KEE, $50,000), Carry Back S. [G3] (GP, $28,500), etc. (LAD, $20,000), 3rd M2 Technology La Senorita S. [L] (RET, $11,000). 2018, $430,600, Oak Tree Juvenile Turf S. (DMR, $60,000), The Vid S.
$20,000), 3rd Jeblar S. (GP, $7,425), etc. Piquant (g. by Arch). 8 wins, 5 to 7, $419,685. Anything But Amie (f. by Algorithms). 2 wins at 3, 2018, $34,520. Henry Turf Championship S. [G2] (SA, $120,000), San Luis Rey S.
Appeal to Reason (g. by Festin (ARG)). 7 wins, 3 to 6, $125,585. Go for Launch (f. by Lear Fan). Winner at 4, $24,940. Producer. Pen and Sword (g. by Lasting Tribute). Winner at 4, $10,378. Happy Ticket S. [L] (LAD, $11,000). Right Proof (g. by Lasting Approval). 6 wins, 3 to 6, $253,670. Flycast (c. by Fly So Free). Winner at 4, $6,210. Bonnie Fellow (c. by Play Fellow). Winner in 2 starts at 3. Righteous (g. by Lord At War (ARG)). Placed at 3. Park, 1 1/16 miles in 1:40.66. Dreamingly (f. by Giant's Causeway). Winner at 4, $45,320. Producer. Dayne's Pulpit (c. by Pulpit). Winner at 5, $29,481.